(Newser) – Europe's biggest and most active volcano is sliding into the Mediterranean Sea and could suffer catastrophic failure one day—even if that day is far away, the BBC reports. Scientists who studied Mount Etna on the Italian island of Sicily say it is sliding just over half an inch annually thanks to weak sediment and a modest slope of 1-to-3 degrees. 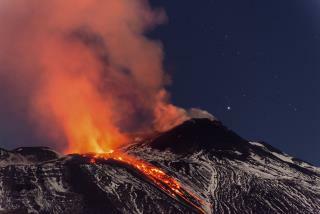 Moving east-south-east, Etna should reach the coastal town of Giarre nine miles away in just over a million years. Of greater concern: Etna could endure catastrophic failure on her lead flank, as experts have seen in extinct volcanoes that went adrift. "I would say there is currently no cause for alarm, but it is something we need to keep an eye on, especially to see if there is an acceleration in this motion," says lead author John Murray. And this is 'news' because...? Wasn't there something in the Book of Revelations about this? Harry Truman, Mt St Helens. He vowed not to leave. He's still there by god.